That’s how Gary Vaughan, coordinator of Lawrence University’s Innovation and Entrepreneurship Program and lecturer of economics, handicapped the second annual The Pitch competition, which begins at 1 p.m. Wednesday April 11 at Fox Cities Stadium. That’s because the Lawrence team of 2017 graduates Ryan Eardley, Felix Henriksson and Mattias Soederqvist won the inaugural competition with their idea for Tracr, a forensic accounting software product. They claimed the first-place prize of $10,000 in cash and an additional $15,000 in professional services. 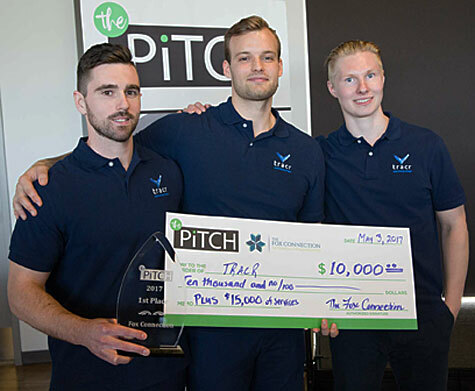 Lawrence students Mattias Soederqvist (left), Ryan Eardley and Felix Henriksson presented the winning pitch at last year’s inaugural The Pitch competition from among eight presenters. The stakes are even higher this year, with a total of $50,000 in prize money and professional startup assistance on the line, up from $40,000 last year. Budding entrepreneurs from Lawrence, Ripon College, St. Norbert, UW-Green Bay and UW-Oshkosh will present their ideas Wednesday, April 11 to a panel of judges in front of an audience of area students, community members, business leaders, entrepreneurs and investors at the Fox Cities Stadium beginning at 1 p.m. Representing Lawrence will be Brian Mirone, a junior from Edina, Minn., and Alejandra Alarcon, a junior from Quito, Ecuador, Nikki Payne, a junior from Bangkok, Thailand and Alfiza Urmanova, a junior from Arsk, Russia. Mirone was the first-place winner of Lawrence’s own on-campus pitch contest held April 7 and received the winning prize of $3,000 cash and in-kind services from Lawrence alumni for “Guido,” his innovative way to teach music using a specialized glove and innovative curriculum. The three-member, all-female team of Alarcon, Payne and Alfiza Urmanova, earned second-place honors for their creation “WellBell,” an innovative wristband device used for emergencies and wellness alerts. “It’s different pitching on campus than it is pitching at the Timber Rattlers Stadium,” said Vaughan, who noted both teams will be working with Lawrence alumni mentors Greg Linnemanstons and Irene Strohbeen as well as community volunteers David Calle and Brad Cebulski to fine-tune their pitch before the big event. Many of the comments Vaughan heard at last year’s The Pitch competition were complimentary on how “professional” the Lawrence students were and how they really knew how to pitch the judges in their presentations, which Vaughan credits to the entire I & E program. “In almost every course in Innovation and Entrepreneurship, the students are getting up in front of their peers, in front of other people and they’re pitching,” said Vaughan. “We’ve got a good program here and everybody knows it outside of the university. Our students know they’re going to have to up their game. Judging this year’s The Pitch competition will be Mike Daniels, representatives from Nicolet National Bank, gBETA Northeast Wisconsin, Winnebago Seed Fund, Gulf Stream Aerospace and Baker-Tilly. Despite its baseball-themed title — The Pitch — and its obvious baseball venue — Fox Cities Stadium, home of the Wisconsin Timber Rattlers Class A minor league team — it took three hockey players to collect “the game’s” biggest hit. Team Tracr — Ryan Eardley, Mattias Soederqvist and Felix Henricksson — picked up the first-place prize of $10,000 in cash and $15,000 in professional services. 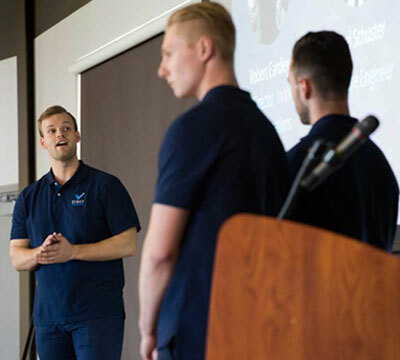 Lawrence University’s trio of budding entrepreneurs Ryan Eardley, Felix Henriksson and Mattias Soederqvist — all members of Lawrence’s men’s hockey team — took home first-place honors at the first-ever northeast Wisconsin The Pitch competition. Modeled after the television show “Shark Tank,” The Pitch featured eight teams of student entrepreneurs presenting their business idea to a panel of judges and room full of business leaders and mentors. The competition featured two teams each representing Lawrence, St. Norbert College, UW-Green Bay and UW-Oshkosh. Eardley, Henriksson and Soederqvist wowed the judges with their presentation on Tracr, a software application they developed for forensic asset analysis. The software automates the task of tracing assets acquired through fraudulent activities. For their efforts, they collected the top prize of $10,000 in cash and an additional $15,000 in professional services (web design/development, product prototyping, marketing, legal advice, accounting support). Mattias Soederqvist (left) gives “the pitch” for the team’s software application Tracr. “This is way better than a hat trick,” said a smiling Soederqvist after receiving the first-place prize. “We have a product that is proven there is a need for and that being said, makes it a lot easier to market,” said Eardley, a senior from Ile Bizard, Quebec, Canada. “I’m so glad we were able to communicate what our product does and the value that we are providing came through in our presentation. That $10,000 check will help get the ball rolling in that direction according to Henriksson. 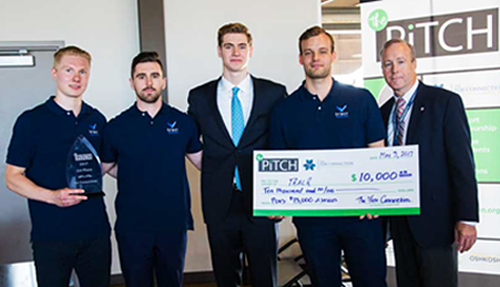 Gary Vaughan (far right), coordinator of Lawrence’s I & E program mentored the university’s student entrepreneurs — Felix Henrickisson, Ryan Eardley, George Mavrakis and Mattias Soederqvist — for the inaugural The Pitch competition. Gary Vaughan, coordinator of Lawrence’s Innovation and Entrepreneurship Program and lecturer of economics, watched The Pitch unfold from the wings with the pride of a father of a new-born baby. Both the local host families for Eardley and Soederqvist attended The Pitch to show their support for the team. All three Tracr team members extended sincere gratitude to Scott Myers, a 1979 Lawrence graduate and member of the university’s Board of Trustees, who has been instrumental in supporting the I & E program and The Pitch competition, financially and otherwise. George Mavrakis makes his pitch for C-Star at The PItch. Sophomore George Mavrakis also represented Lawrence at The Pitch. A saltwater aquarium aficionado who started his own business in sixth grade and won the 2016 LaunchLU contest, Mavrakis presented C-Star, a commercial product designed to eliminate one of the least favorite jobs of owning a fish tank: cleaning the sand. Second place honors at The Pitch were awarded to Abbie Merrill from UW-Oshkosh for her “In Our Hands” political app, which enables users to comment on upcoming legislation. She received $5,000 in cash and $10,000 in professional services. The Pitch was organized by The Fox Connection, a collaboration of academic institutions in northeast Wisconsin to enhance entrepreneurial education and opportunity for area students. During a 38-year career with 3M, the company that developed Scotch Tape and the Post-it Note, Dwight Peterson learned the importance of innovation and creative thinking. Dwight and Majorie Peterson have donated $1.5 million to establish an endowed professorship in innovation. Adam Galambos, associate professor of economics, will be the first holder of the professorship. Peterson, a 1955 Lawrence University graduate, is a firm believer that a liberal arts education can be a hotbed of innovation because of the way liberally educated students think about ideas and problems from the perspectives of multiple disciplines and look at old problems in new ways. 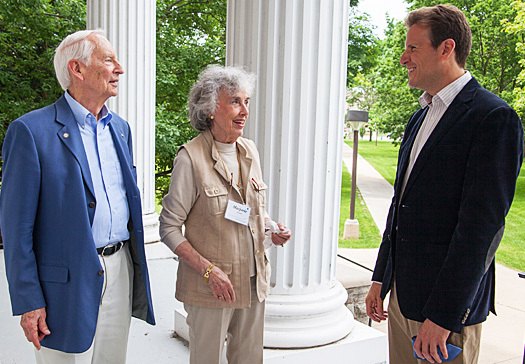 To fuel innovative thinking at Lawrence, Peterson and his wife, Marjorie, have established an endowed professorship in innovation with a $1.5 million gift. Adam Galambos, associate professor of economics, has been named the first holder of the Dwight and Marjorie Peterson Professorship in Innovation. Appointments to endowed professorships are made in recognition of academic and artistic distinction through teaching excellence and/or scholarly achievement. Galambos was one of three faculty leaders who launched Lawrence’s program in innovation and entrepreneurship in 2008. Dwight Peterson, a former member of the Lawrence Board of Trustees (2005-2013), spent his entire professional career at 3M, where he says innovation is ingrained in the company’s culture. “The long term history of 3M is based on continuous development of new products,” said Peterson, citing Wet-Or-Dry sandpaper, masking tape, Scotch Tape, magnetic recording tape and reflective sign sheeting as examples of the many products the company has created. “I learned about Lawrence’s program in innovation and entrepreneurship a few years ago and found it stimulating. David Burrows, provost and dean of the faculty, said the college was “very excited and grateful” for the Peterson’s gift establishing the professorship in innovation. While thrilled to be named the professorships inaugural holder, Galambos said its establishment is the result of the collaborative efforts of many. 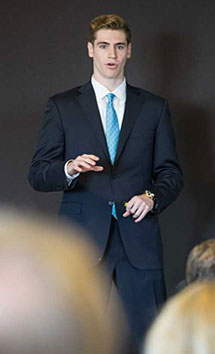 “Dwight and Marjorie’s generosity is wonderful recognition of the work we have done over the past few years, starting with Marty Finkler in economics, who introduced the idea of entrepreneurship to the Lawrence community more than 10 years ago, and John Brandenberger in physics, who first proposed that we teach innovation,” said Galambos, who joined the Lawrence faculty in 2006. A number of student-created and directed ventures have grown out of the I&E program — the Rabbit Gallery, a pop-up art gallery in downtown Appleton, Greyfell Theatre, a company devoted to producing student-written plays, the Paper Fox, a printmaking workshop with a community programming component and the Lawrence Baroque Ensemble, a student performance group that focuses on community outreach activities — and other projects continue to be created by students who have taken I&E courses. 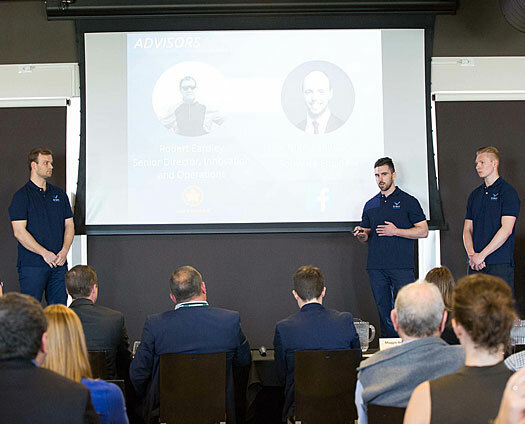 This spring, students Joe Bazydlo and Eddie Elizondo were among 20 finalists from among more than 250 teams from around the country to deliver a presentation in Princeton University’s Entrepreneurship Club’s annual national competition. They pitched a smart phone app — Trailblazer — to be used by hikers and other trail users to unlock preloaded information about specific locations in U.S. national parks was was developed in Lawrence’s “In Pursuit of Innovation” course.